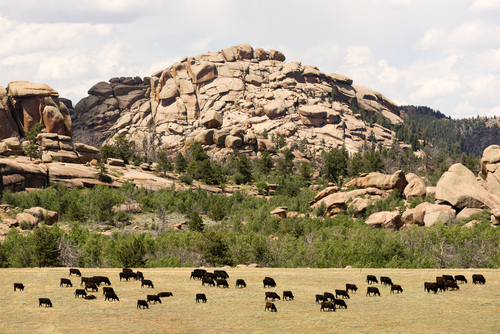 Ranching is an integral part of Wyoming agriculture. Raising cattle is the backbone of the agricultural industry in the state. Raising a quality herd can create tidy profits that you can use to build and grow your ranch. The following are four breeds that will fatten your wallet if you take the time to fatten up your herd before taking them to the sale barn. 1. Angus - Imported from Scotland in the late 1800's, Angus cattle are highly prized for the quality of meat they can deliver. They are the dominant beef cattle brand in America. Some estimates place the number of Angus cattle in the market as high as 60%. The most prized of the bunch are those that "meat" the American Angus Association's stringent requirements regarding marbling, rib-eye size, and the color of the hide. 2. Gelbvieh - This German import came to the US in the 1970's and is still working to increase the breed's footing in the US meat market. Crossbreeding has strengthened the quality of the meat. Today there are more than 50,000 head in the US. It's a market that has lots of room for growth. Wise ranchers can make solid profits if they can get into the market and establish their herd as a model for others to follow. 3. Hereford - First imported from England in the early 1800's, Hereford cattle grow up quickly and have a high conversion ratio. This makes them a cost-effective breed to raise in the region. Short and stout, Hereford cattle deliver a valuable meat product to market that is full of flavor and guaranteed to satiate even the most finicky of tastes. Looking to dig your heels deep into the world of Wyoming agriculture? The Brooks Companies has plenty of land where you can set up your operations. We invite you to contact us at 877-468-9802 to learn more about the fantastic ranching opportunities we have available for you to choose from.